Today was the big day. We would finally be leaving for Antarctica! This is a tremendous privilege and we consider ourselves very lucky to travel to a destination that very few travelers ever have the opportunity to visit. My brother and I slept late and then began rearranging our gear for Antarctica. Since there are no stores in Antarctica, Jeff and I did some shopping in Ushuaia. I bought some carved stone penguins and some postcards for the trip. I hoped to later mail this postcards from a base in Antarctica. 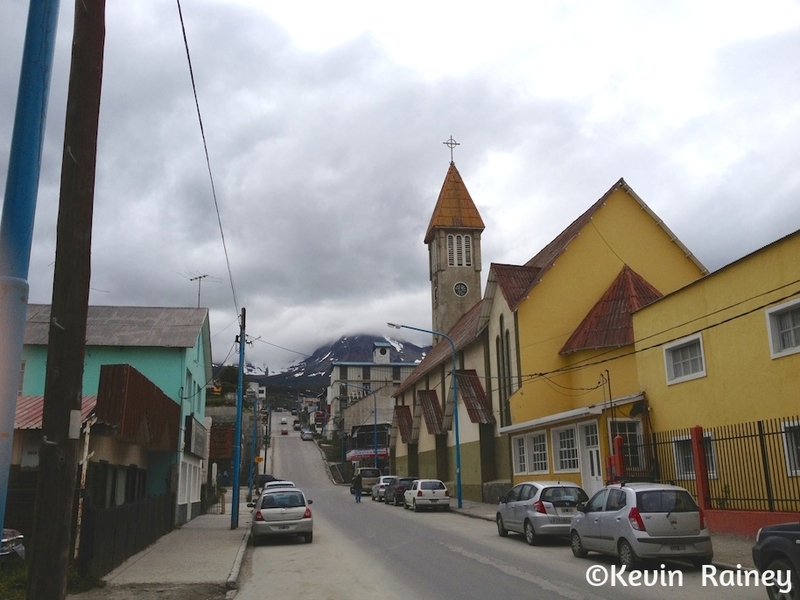 Then Jeff and I ate lunch at the Lomitos Martinica grill that we enjoyed the last time we visited Ushuaia. We had our last steak meal before heading off to Antarctica! After lunch, Jeff and I walked around for a little while before heading down to the Hotel Albatros, our meeting spot for our departure. For the first time, we saw our amazing Russian expedition ship, the Akademik Sergei Vavilov (Академик Сергей Вавилов), anchored across from the hotel in the harbor. Due to security and logistical reasons, a bus would arrive to pick up all of our fellow travelers and transfer us at the same to the ship. We met a few of our fellow travelers at the Gustino Restaurant at the hotel before our bus arrived. We met Matt, an American about our age from Orlando, who had received permission from his wife to undertake this trip alone. After chatting until around 14:30 p.m., we went outside with our bags and loaded up for the ship. Besides packing, having the right gear and having a medical clearance, there is another necessity before going on a voyage to Antarctica. All such voyages require comprehensive travel insurance with high limits. These policies must cover medical costs in case of hospitalization, emergency travel and repatriation. There are no medical clinics in Antarctica, so a medical emergency would be extremely expensive. That’s why it’s so critical to have sufficient travel insurance. Upon passing through customs, we disembarked the ship. Our luggage would be brought to our room. As we boarded the ship, we were greeted on board by our tour operators, One Ocean Expeditions, out of Canada. We were given our room assignment and welcome information. Although I speak and read some Russian, I’m not much beyond functional, so I was glad to see the temporary signage on the decks of the Sergey Vavilov in English. On the fourth level Jeff and I went to check out our room. We found out we had been upgraded and wouldn’t need to share our room with a third person, so that was great! After checking our room, we went to the lounge on the observation level for the welcome reception. They served drinks, finger food and hor d’ourves. Our guides wore their blue shirts to identify themselves and they are an interesting crew from all over the world. Many of them have a specialty, such as marine expertise, bird knowledge, historian, resident photographer and so on. Most of the guides were from Australia, New Zealand, Canada, the U.S., Britain or Europe. The crew of the ship were all Russian, as the ship is leased out by Russian Academy of Sciences – its owners. 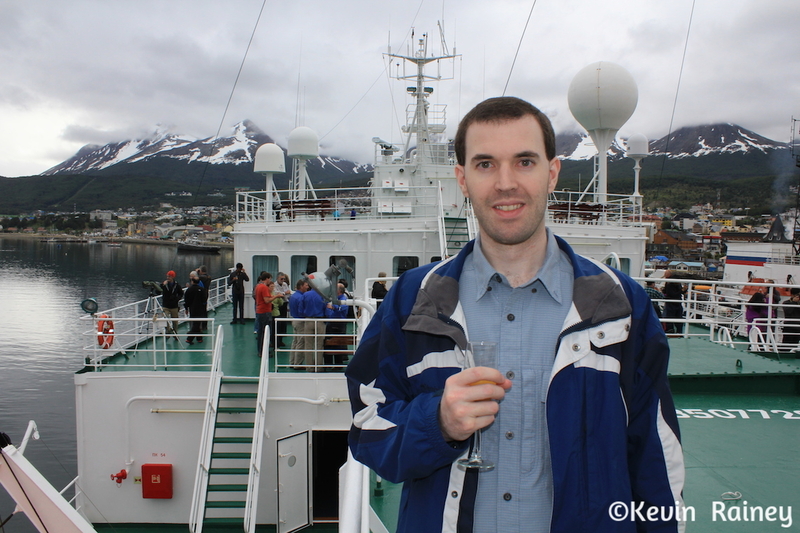 Then Jeff and I went outside to say adios to Ushuaia. Berthed next to us was our sister ship, the Akademik Ioffe. Both ships are based out of the Russian enclave of Kaliningrad and travel extensively to polar regions. In fact, we learned our captain, Captain Valery Beluga, is the longest-tenured commanding sailor in Antarctica. 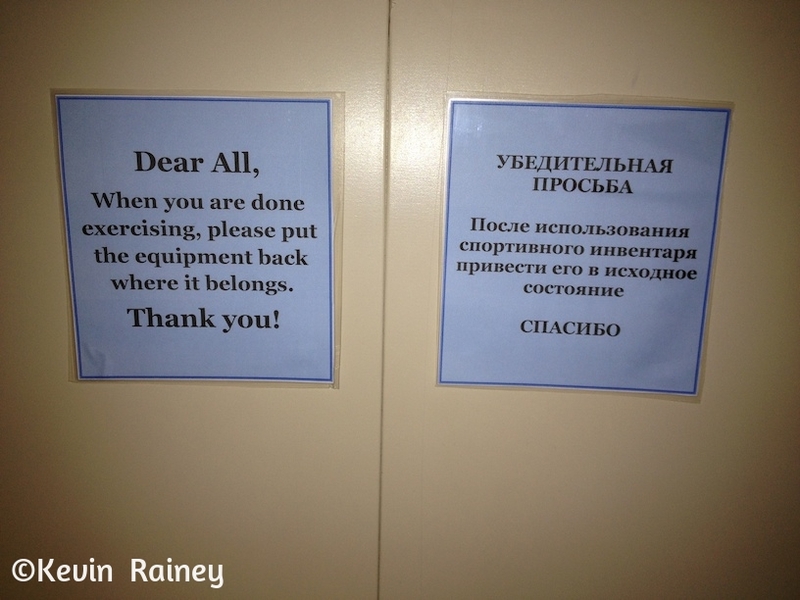 The ship has an open-bridge policy, but our guides reminded us to respect the duties of our Russian crew. 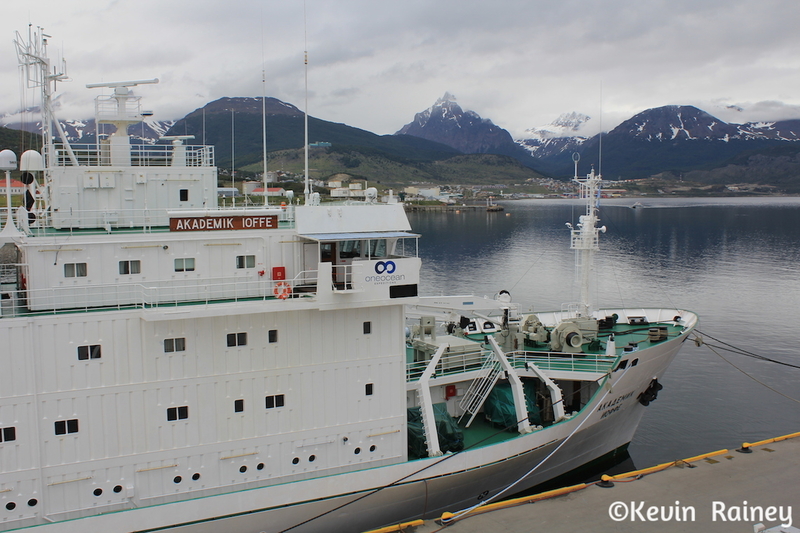 The Akademik Sergei Vavilov is an ice-strengthened, expedition vessel. It’s integrated internal ballast system and external hull stabilizers, along with its size, helps tremendously reduce severe rolling in heavy seas. 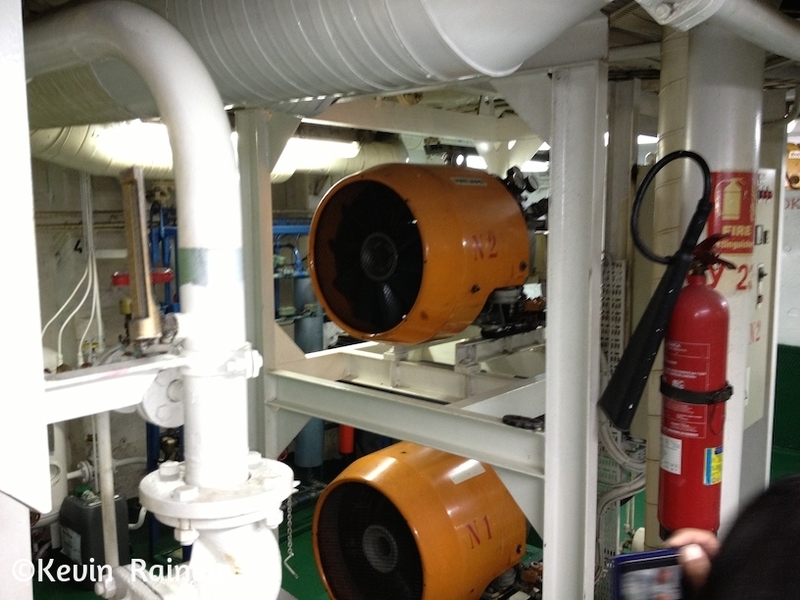 The ship also has bow and stern thrusters that allow it to spin on its axis. Multiple pitch propellers offer immediate reduction in speed. The Sergei Vavilov also features a large mud room for storing boots and allowing transit between the zodiacs and cabins for each excursion. Other facilities include a bar/lounge, library, theatre-style presentation room, fitness room, multimedia station, gift shop, massage room, hot water spa, sauna and plunge pool. You name it, this ship has it! 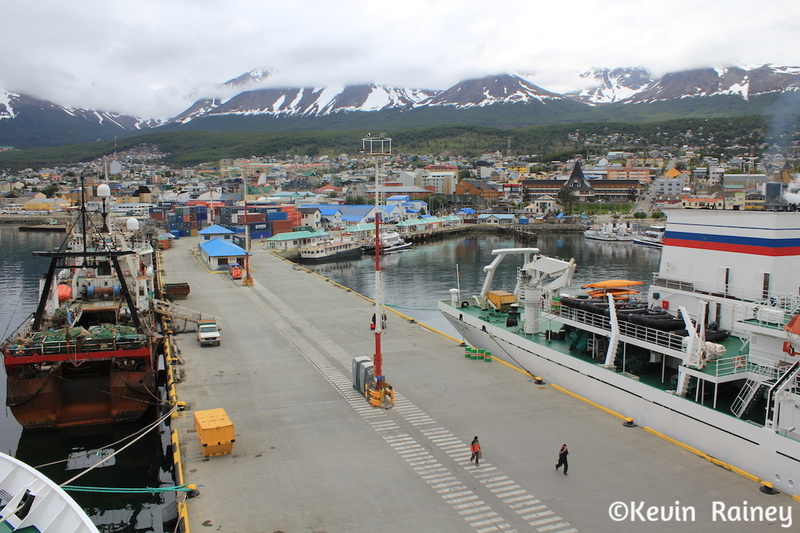 Before leaving Ushuaia, we participated in the mandatory muster drill. Some guests surprisingly didn’t know the difference between port and starboard, so that was quite a chuckle watching some tourists go to their wrong lifeboat. We had a large group of Chinese guests on board and a number of them didn’t speak English. They had quite a challenge understanding their correct lifeboats! 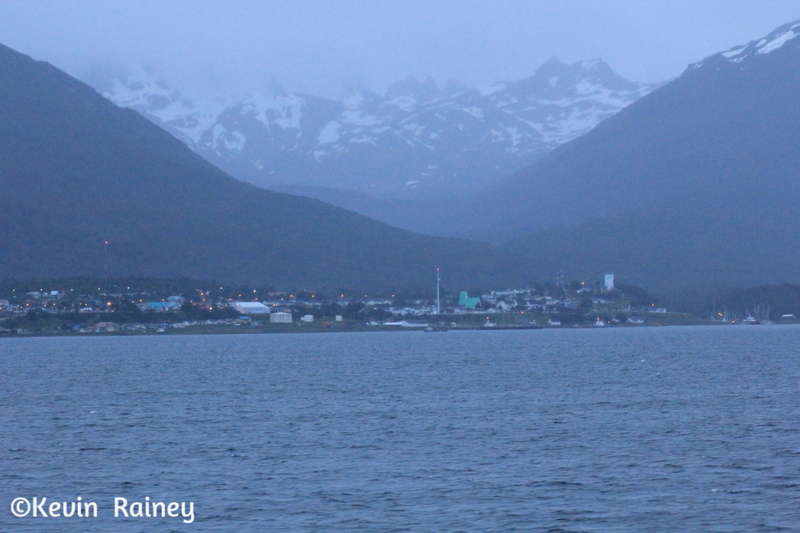 Out on deck, Jeff and I watched us leave Ushuaia as we cruised east through the Beagle Channel. We met some of our fellow travelers including Les, traveling by himself from the Cornwall region of southwest England. We also met Phil, an Australian traveling alone from New South Wales, Australia. They were rooming with Matt and we enjoyed hearing their stories from their trip so far. We also met Noah and Leslie, both naturalists who are part of our staff and penguin experts. Leslie is a Canadian living in New York traveling with us as a researcher with the environmental research group, Oceanites, to conduct some penguin colony research. Noah is younger than me and is an American penguin scientist and bird researcher. Noah pointed out a Magellanic penguin in the chilly water as we cruised down the Beagle Channel. Around sunset around 22:15 p.m., we passed Puerto Williams, the southernmost town in Chile. Occasionally, smaller ship leave from the Chilean town to Antarctica. From the distance, it seemed much smaller than city of Ushuaia. Before dinner, we met some of our other travelers in the lounge. We talked to an older Dutch lady in her sixties named Ava. She was an interesting lady who had traveled a lot in the world. Then we headed down to the dining room for dinner. We dined with Eva, a young blonde woman from Sweden who was one of the guides for our expedition. This was going to be one of her repeat journeys to Antarctica, but you could tell she was just as excited about it. Before going back to our room for the night, we walked around and explored the ship. During the evening we rounded Cape Horn before heading out to the open Drake Passage. Home to the world’s most violent waters, the Drake is dreaded by sailors. 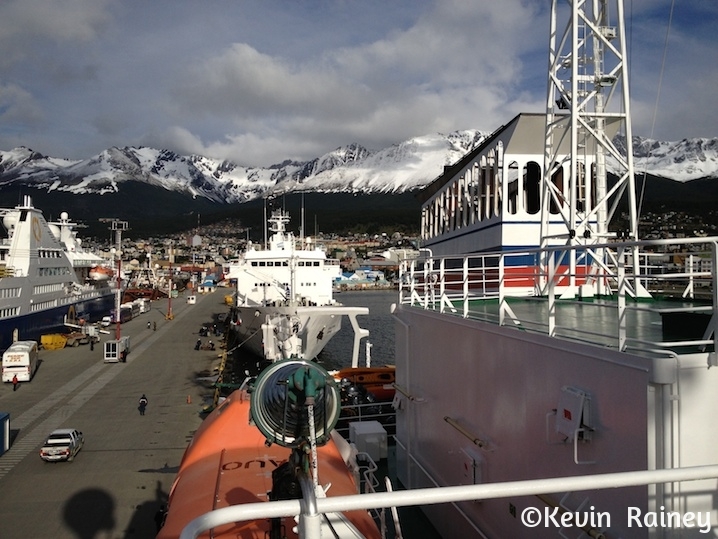 Just a few years before, we had met some travelers in Ushuaia who were making a return trip to Antarctica. 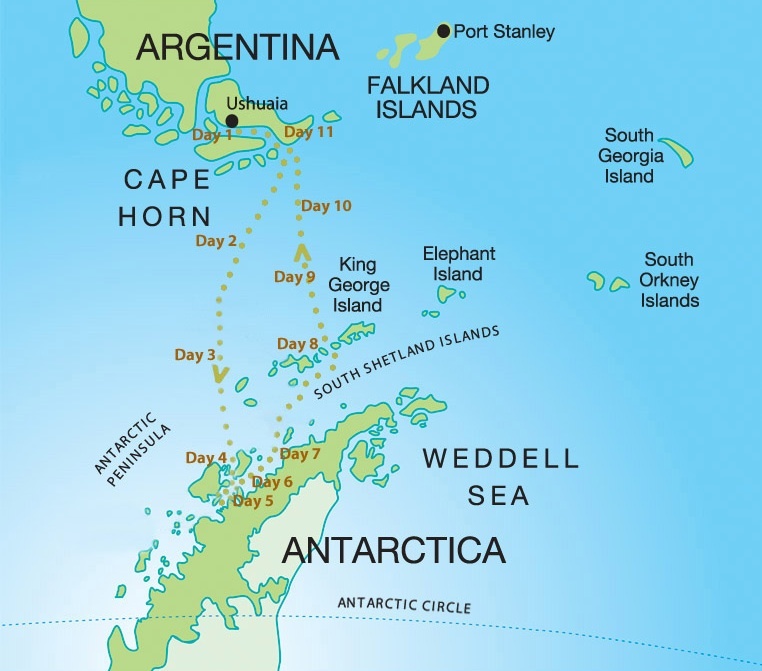 They were on the Canadian vessel M/S Explorer, which sank in a matter of hours in the Bransfield Strait near the South Shetland Islands. Jeff and I usually don’t get seasick, but we didn’t want to chance it on this trip. Once you become sick, it’s hard to get back to normal. We also didn’t want to be nauseous for the three-day trip down and three-day journey back. We wore scopolamine patches and wristbands as extra precautions. With the scopolamine patches, we slept well.